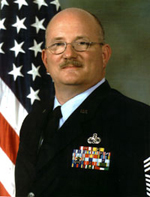 In 1999, Chief Master Sergeant Rick Honeywell was deployed to a four-month stint in Kuwait. To his dismay, he found himself on a base that had no recreation facilities – no movies, no library, no gymnasium. Chief Honeywell's wife, Chrissy, and other Air Force spouses responded by sending the squadron a gigantic care package of candy, games and books. Chrissy's father, Dan Bowers, became inspired by the situation. He selected paperback books from his own shelves to send overseas. Then he turned to others for contributions. Soon he had collected cases of books and shipped them all to Rick in Kuwait. "Before anyone realized it," recalls Chrissy, "There were 500 books over in Kuwait, and Rick's squadron was building bookshelves." Operation Paperback was born. Sadly, on 04 November 2002, after a short and intense battle, CMS Rick Honeywell succumbed to multiple myeloma, a cancer of the bone marrow. He now rests in Arlington National Cemetery among those with whom he was so proud to serve. He continues to serve as an inspiration to all who knew him. Hello, I WANT TO THANK ALL THE VOLUNTEERS AT OPERATION PAPERBACK FOR THE BOOKS, AND ESPECIALLY A SPECIAL THANKS TO CHRISSY WHO PACKAGED THE BOOKS, AND THEY ARE ALL REALLY NICE AND INTERESTING!